I was fortunate to see The Police on their Synchronicity Tour at the Tacoma dome in 1983 and then Peter Gabriel’s So tour at the LA Forum in 1986. Both shows were brilliant and proved to me that not only do both of these artists know how to make great records, they can bring the performances of those studio numbers into a live setting and deliver solid, professional, yet heartfelt performances. Sting, who is not only a great vocalist and songwriter but a brilliant, jazz trained bassist. It seems that he is often overlooked in this area. He has always been effective in pivoting back and forth between straight 4/4 time signatures to odd and off beat time signatures, incorporating world-music elements. Peter Gabriel has the incomparable and long-time mainstay, Tony Levin, on bass and Chapman stick. Like Sting, Peter Gabriel was incubating elements of world music into some of his earliest solo work. These two together on stage made the perfect paring of musical chops, styles, genres and rock/pop legend status. Of course both artists delivered their standard hits, like the romantic and beautiful “In Your Eyes” and the lovely and encouraging number “Don’t Give Up.” Sting performed catchy dittys like “Every Little Thing She Does is Magic.” Sting backing Gabriel and his band was a nice touch, as it is always great to hear and see world-class musicians and artist sharing the joy of music on stage. Billed as Rock Paper Scissors – this show wasn’t quite like when Sting shared the road with Paul Simon recently. For those gigs it was a bunch of mini-sets, with some get-togethers too. But this was a super-band, two sets of musicians on stage the whole time acting as one and the two solo artists – both bandleaders turned solo acts – on stage to share in one big super-set; not only that they even shared vocals on each other’s songs, and doffed the cap each, essentially performing a cover of the other man’s song in front of him. It was the last show of the American tour and so the act is so well honed now, but never did it feel like a by-rote roll-out of hits. Beginning with Gabriel’s haunting The Rhythm of The Heat the two drummers and percussionist lit the campfire and started cooking. Sting was in next with If I Ever Lose My Faith in You and his knack for picking up a throwaway pop line now feels prescient, as nearly a quarter-century after he wrote it he gets to deliver “You could say I’d lost my belief in our politicians” drawing it out to stare deadpan knowing he’s got the knockout, “They all seemed like game show hosts to me”. The crowd erupted. For the first of so many times. A bit of self-effacing banter as Gabriel reckoned they were now known as The Tantric Twins and the two gentlemen explained the game plan for the evening, a type of professional karaoke, two friends picking up a thread after 25 years, laying out a bunch of songs from across their careers. 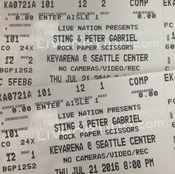 So from Gabriel it was No Self Control and then Sting played the first of several songs from The Police with Invisible Sun. Both Games Without Frontiers and Shock The Monkey followed, Sting taking a verse or two of each and with Frontiers in particular you could imagine it now as a song he might have written had The Police called it a day a half-decade earlier than they did. Gabriel’s Secret World moved from beautiful balladry to epic rock-out, and if you thought by this point that it was the former Genesis frontman in the lead – not that either singer was keeping track of points or worrying about own-goals – you’d be right. But Sting knew something we didn’t. As Driven To Tears, another great Police album track, surged into life a figure leaped up onto the stage and was pointed to the microphone. It was local hero Eddie Vedder. The place erupted once again. More than just two old pals sharing their songs, more than just the connection to both being the frontman for a big act before going solo, to exploring world music, to knowing that Stewart Copeland is a hi-hat wizard, Gabriel and Sting’s catalogs really do mesh so well. It’s not so much that the songs were finishing each other’s sentences, more a case of being the exclamation point, or the counterpoint, the coda, continuation, even the correct segue sometimes. Case in point – Sting’s Fragile was dedicated to the recent police shootings in America, the Parisian Bastille Day tragedy, the ugliness of a world that needs fixing, needs rewriting. And so this short poetic ode – his own Spanish guitar framing the words – was nice enough but risked having no real poignancy. No matter. Gabriel’s Red Rain carried the emotional weight. Vedder returned to the stage to lap up some more applause and to serve the song – it was great to hear him singing live – particularly since he wasn’t offering out any of his own material. Sting used Gabriel’s early Genesis song, Dancing With The Moonlit Knight, as an intro to The Police’s Message In A Bottle – the “selling England by the pound” line also newly prescient, Sting’s bottled message now an implied paean for political change. And if that little attempt at recontextualising and reconceptualising the song didn’t quite stick – and it’s just good enough to hear that song at any rate, especially with the skilled players in the monster-band behind – Gabriel’s Don’t Give Up had its back and of course was a mid-set highlight. Jennie Abrahamson, Gabriel’s hugely talented backing vocalist, stepped up and into the Kate Bush role. Peter Gabriel may have traded the fox-head for a simple black hoodie, something fans of his earliest music could never have predicted, but he’s still able to deliver emotional impact, every song a set of slow-moving, purposeful footsteps. Every song a movie. Every song an enormity. Sting’s music is lighter – it’s impossible not to notice this but his voice is still a powerful instrument, and the musicality shines through in his songs; this was a no-filler set of Sting songs too, even the lesser-known tunes (in the scheme of so many hits) were highlights, in particular The Hounds of Winter, Vinnie Colaiuta’s huge driving ride cymbal and precise opening press roll setting up the impact of the song. Big Time and Englishman in New York went well together. For me they’re both songs I thought I didn’t really need to hear again but they were just so huge so right in this environment. Solsbury Hill followed Englishman in New York, again so much of this night was in the clever, subtle decision-making behind the set selections and placement. I had tears in my ears as Solsbury Hill bounded into life once again. Always a joyous song for me and to see Gabriel and his band members skipping across the stage was to hear and see and feel the childhood theme coming to life, flowering up through the song. Everyone’s heart going boom boom boom! Gabriel decided to rework (Sting’s) If You Love Somebody Set Them Free as a sly, slinky little piece of sardonic jazzy-blues pop, the sort of shape any new Leonard Cohen song might make. Sting took the reins back for Roxanne and had set this trio up with Every Little Thing She Does is Magic. Gabriel performed the evening’s only new song, Love Can Heal, a new tune written for Jo Cox. Another wonderful Gabriel ballad it was also the continuation of one of the evening’s sombre themes: political upheaval and unrest, fear and racism and violence and how to address these problems, how to reset the geo-political pulse. Lip-service? Sure. But it never felt too cloying. And this time Sting had the winning counterpoint, his Desert Rose never sounded better dancing in on a mix of Turkish and Arabic rhythms. In Your Eyes was the set closer, Abrahamson and Sting combining to sub for Youssou N’Dour’s original duet part. Gabriel again dancing about the stage and encouraging his band members to join his pied-piper skip. A stunning evening. A magical concert. A treat of timing for me to be in this town on this night. Gabriel was the reason to attend for me. His music means more. But I can say that too having seen Sting twice already. Both of them were amazing, but there’s just something very real about Gabriel – something always believable, something so powerful and intoxicating about the very best of his songs. With Sting it’s less about the emotional resonance and more about the killer performance. Vinnie Colaiuta on drums (for Sting) and Tony Levin on bass (for Gabriel) were the superstars. But then there’s Dominic Miller’s guitar too, and Jo Lawry (backing vocals) worked hard across both teams. A stunning band (well, two bands – technically) and it’s not like when you rave about, say, Brian Wilson’s band – knowing full well they’re covering for the singer. This was just stunning musicianship in support of two great musicians still at the top of their respective games. We heard how well their music and their musicianship pairs up. And we were sent home with the one-two encore punch of Every Breath You Take and Sledgehammer. As with the Big Time/Englishman double it was what was required for the night. Everything in its right place. And that’s exactly what we heard here. A most amazing show.